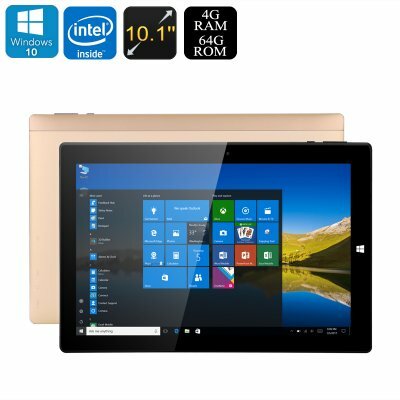 Successfully Added Onda oBook 10 Pro Windows Tablet PC - Licensed Windows 10, Cherry Trail Z8700 CPU, 10.1-Inch Display, OTG, Micro HDMI, 4GB RAM to your Shopping Cart. The Onda oBook 10 Pro is a beautifully designed and powerful Windows tablet PC that features a stunning 10.1-Inch IPS Display. Portraying all media, files, and games in mesmerizing Full-HD resolution - this tablet computer is perfect for entertainment, study, and business purposes alike. Thanks to its unique design and OTG feature, an external keyboard can easily be attached to this tablet, turning it into a full-blown Windows 10 laptop – allowing you to efficiently write documents on this little beauty. With its sleek and lightweight design, the Onda oBook 10 Pro is highly portable and can easily be slipped in your bag – allowing you to carry it along and enjoy all its benefits wherever you’re going. Featuring a licensed Windows 10 operating system, this tablet computer comes packed with the latest features that Windows users are familiar with. Its powerful Intel Cherry Trail Z8700 processor brings along a powerful performance, letting you enjoy the most demanding of games and programs without dropping a frame. Built for speed and energy efficiency, this Quad-Core CPU can handle whatever you throw at it. Along with its powerful CPU comes 4GB of RAM that supports excessive multitasking sessions. From now on you no longer have to worry about slowing down your device while using multiple programs at the same time as this Windows tablet PC is guaranteed to efficiently meet all your demands. With 64GB of internal memory and the added option to extend this with another 128GB externally; there will be plenty of space for you to store all your games, media, and files at any time. Its astonishing 10.1-Inch Full-HD display assures that you will be able to enjoy all this Windows tablet computer has to offer in vivid color and extreme detail. Increasing your visual experience even further is the tablet’s 8th generation Intel HD Graphic unit that supports you in enjoying graphically intensive games and all other sorts of media alike. With its micro-HDMI cable, the Onda oBook 10 Pro Windows tablet furthermore lets you connect your device to your television, allowing you to enjoy all this tablet computer has to offer from your large screen TV. Packing a massive 6000mAh battery, this Windows 10 tablet computer holds enough power to get you through the most demanding of days without needing to worry about battery life. Supporting up to 6 hours of continuous usage time, the Onda oBook 10 Pro gets you through multiple Full-HD movies and hours worth of online gaming and web browsing. Simply carry along this beautiful tablet PC in your backpack and you can be assured that, from now on, you’ll never have to be bored again. With its massive storage, top-grade hardware, epic battery, and stunning display – this tablet PC brings along a user experience like no other. The Onda oBook 10 Pro comes with a 12 months warranty, brought to you by the leader in electronic devices as well as wholesale electronic gadgets..
Arabic: - ويندوز الكمبيوتر اللوحي - Chinese Simplified: - Windows 平板电脑 - Czech: - Windows Tablet PC - Dutch: - Windows Tablet PC - French: - Windows Tablet PC - German: - Windows Tablet PC - Hebrew: - Windows Tablet PC - Hindi: - Windows टैब्लेट PC - Hungarian: - A Windows Tablet PC - Italian: - Windows Tablet PC - Japanese: - Windows タブレット PC - Korean: - 윈도우 태블릿 PC - Malay: - Windows Tablet PC - Norwegian Bokmål: - Windows tavle-PC - Romanian: - Windows Tablet PC - Russian: - Windows Tablet PC - Spanish: - Windows Tablet PC - Thai: - แท็บเล็ต Windows PC - Turkish: - Windows Tablet PC - Vietnamese: - Windows Tablet PC.